This has been a strange summer - far too much heat and far too much wind! I have not had nearly enough chances to get out on my kayak and photograph the birds. So when the weather report suggested two good days at the end of last week I decided to try for one of them. Sunrise is about 6am right now so a high tide at the same time seemed a bit of a gamble to me. The next day the tide would be nearly an hour later and plenty of daylight by that time for bird photos. It looked perfect when I got down to the bay. No wind and the bay was beautiful. (Nothing is ever quite perfect! I had forgotten to take down insect repellent - and decided I didn't have time to go home and get it! I went home covered with bites that were turning into red welts!!) It is magical to kayak over clouds reflected in the water. This is the view from the airport roost looking towards Poverty Point on the other side. Poverty Point is a popular camping spot for people with 4 wheel drive vehicles to get down there. 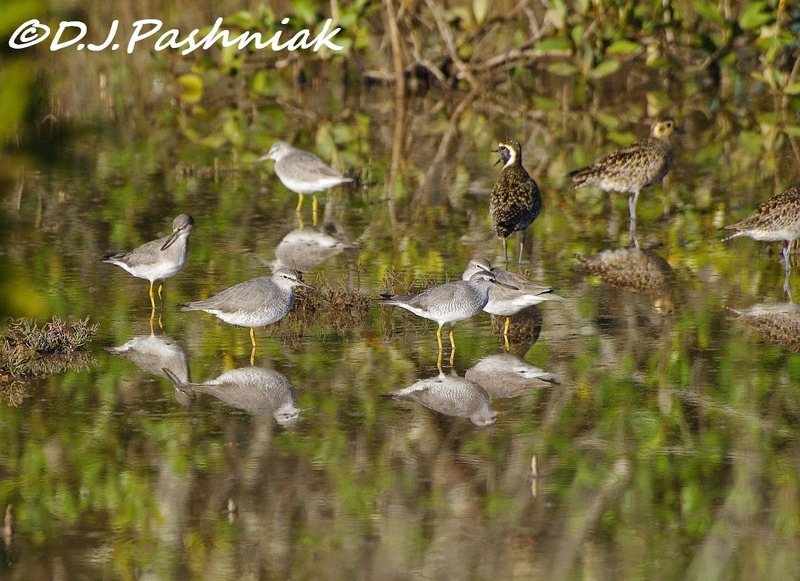 There were still lots of Grey-tailed Tattlers, a few Terek Sandpipers and a number of Pacific Golden Plovers. I was hoping for good photos of Pacific Golden Plovers in breeding plumage. Before I got close to the roost the Tattlers had flown - some to the other side of the bay and some to the water in behind the sand spit. 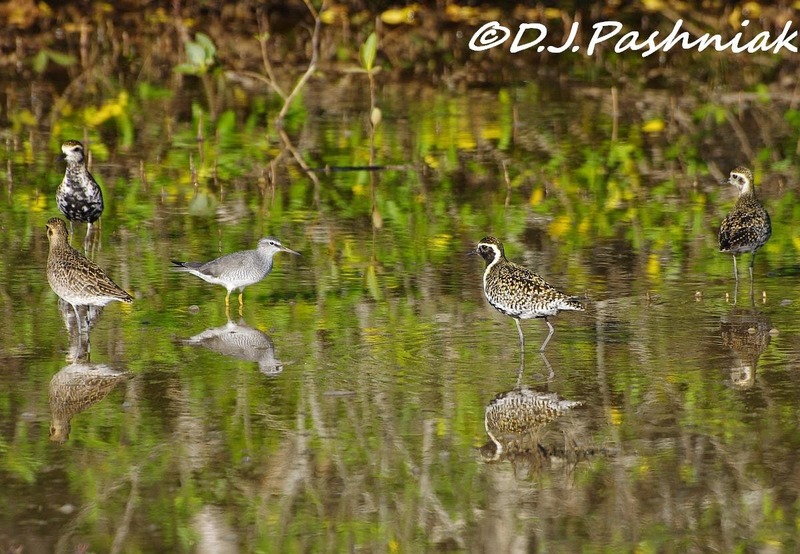 The Plovers walked over the sand spit and joined the Tattlers in the water. It should have been perfect but good lighting and still water made too many reflections for me to get the photos of the birds without a cluttered background. 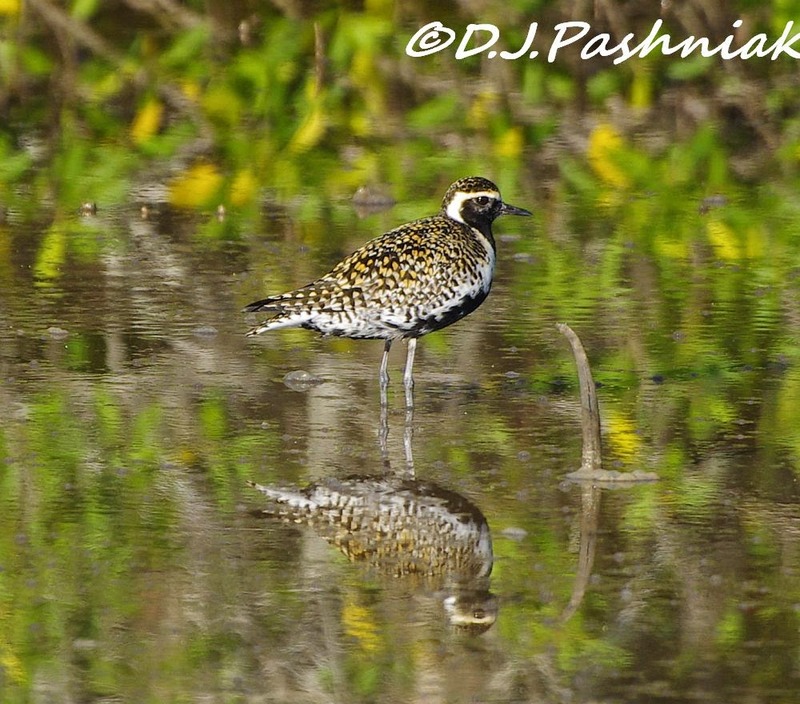 This is the only photo of a Pacific Golden Plover without too much color and reflections behind it. Oh, I do love your captures for the day, Mick!! The reflections on the water are awesome!! And such beautiful birds!! Thanks for sharing the beauty!! I think many of us have had a weird year/season weather wise!! Hope you have a great week ahead!! I can't think of anything better than kayaking early in the morning watching the birds. Some great reflections there. wow! i love these! the mottled birds and mottled background with clear reflections are wonderful! What a great place to kayak, over the cloud reflections and among the birds. Nice shots. 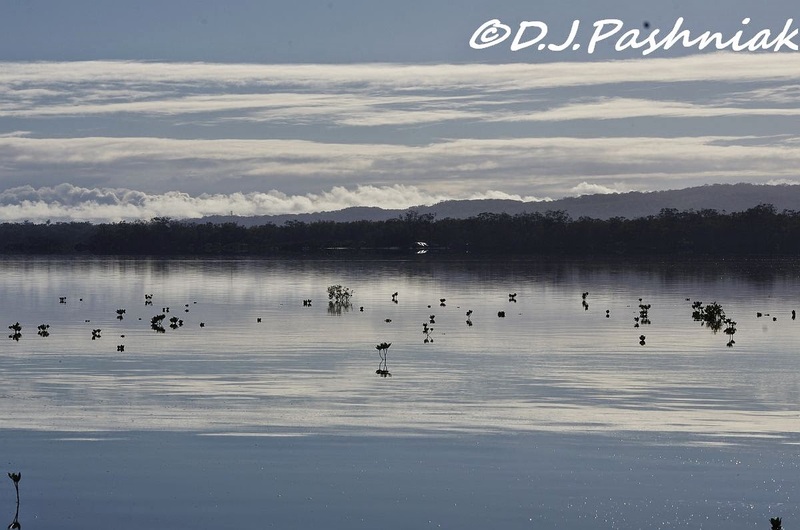 Great area for shore birds, love those reflections. We had a strange and very long winter here! It is spring now, well the calendar says so, but we are in for more snow tomorrow! I always enjoy visiting your blog and seeing the beautiful scenery and shore birds. Makes me a little "homesick", I lived in Australia for a few years. Excellent shots, beautiful reflections! I think the reflections are cool! I love the Golden Plover, a gorgeous bird! Great shots! Beautiful shots of birds and reflections. I think this is a gorgeous set of photos! That last photo is super!!!! Wow! These are beautiful. The water is so clear and mirrorlike. 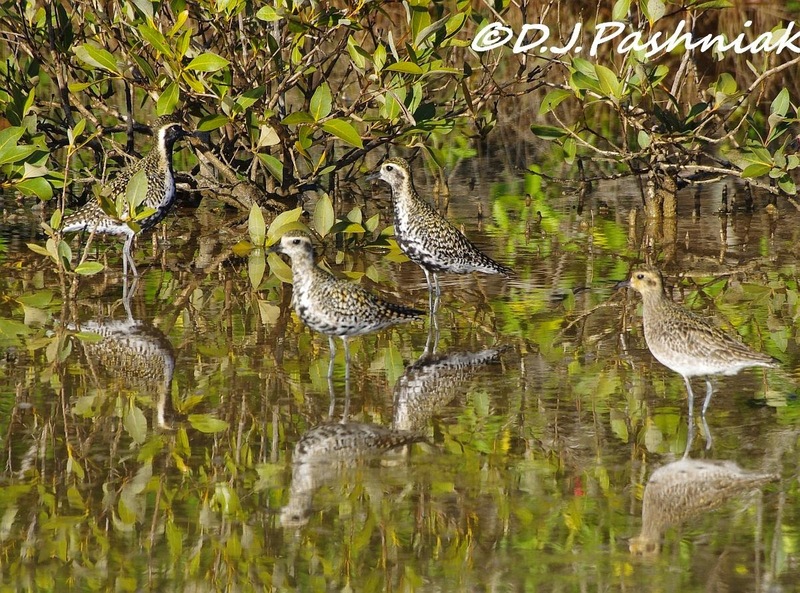 The Golden Plovers are great, beautiful photos. Hi Mick ... our Winter was exceptionally wet and very limited opportunities for photos. Despite the conditions and the backgrounds you produced an excellent series of the waders. The silvery blue tones in the first scene are so magical. And love the variety of reflections of these lovely birds. We had a weird winter too in the UK. Insect repellant? What's that? Just joking Mick,I hope to get to use some this year. 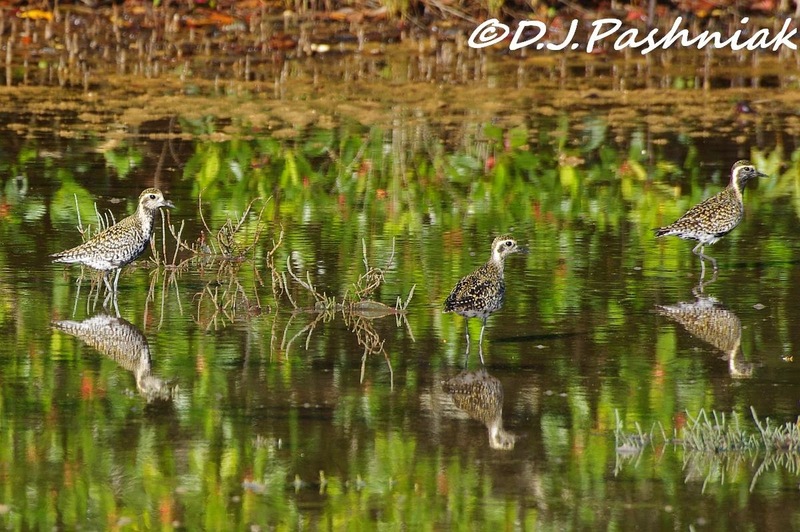 Yes, water reflections can be a nuisance for digital photography but I think you came away with good pics, especially those Pacific Plovers again. The reflections that you call "clutter" provide a beautiful backdrop for the birds. Beautiful images! Thanks to all who commented. You will realize that I was disappointed that I didn't get clear and uncluttered photos of the birds in breeding plumage. Your comments made me see the photos differently - the cluttered background is definitely part of the habitat - and that is good too! Great shots - so nice to see the waders in their finest gear! Wonderful light by the look of it. Oh that golden plover!! Lovely shot of a lovely bird.